"'Phoebe, we'd like some toast, and some of Mrs. Finch's raspberry jam, and chocolate cake, and ginger scones, and a big pot of tea, please?' instructed Charlotte, beaming at Phoebe. 'Ooh, and some of those nice chocolate biscuits, not those ghastly coconut ones, please.'" Contrary to what my mother thinks, my sister and I are not the only people in the world who detest coconut. This book is living proof of it. As a person who suffers from chronic BHC (Burning Hatred of Coconut), I have to scan Thai restaurant menus with a vigilant eye. I basically skip over the curry section, because Thai curries are made with coconut milk (the most dreadfully fragrant form of coconut known to man). Thankfully, most of the other dishes are safe. I recently discovered a new favorite, known as Wok Basil Chicken at Pure Thai. 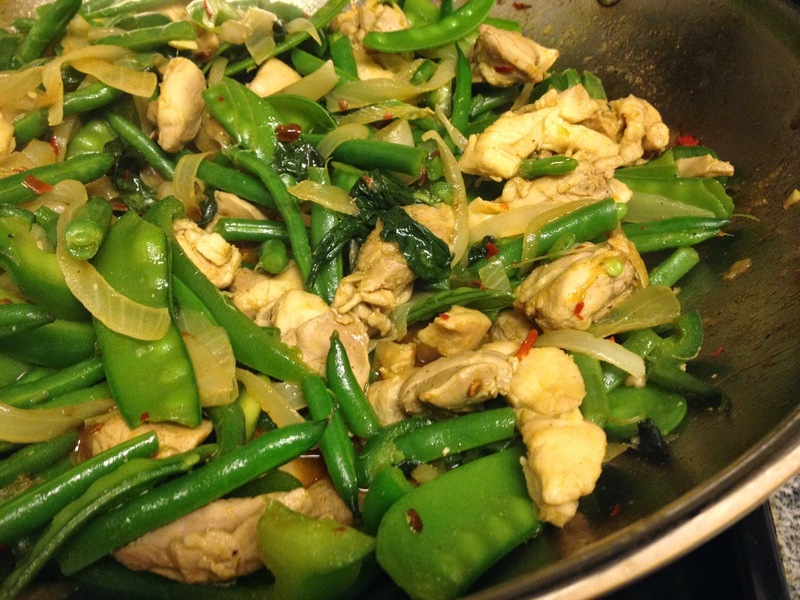 Basically, it's a minced chicken, stir-fried with string beans, chili, garlic, and basil. I think it either has a bunch of jalapeños or Thai chilies in it (or both) because it's pretty darn spicy. The crunch of the string beans really helps elevate ground chicken to a level of fresh, flavorful fare. I created my own version with string beans (or, as I like to call them, "haricot vert" because it sounds fancier) and other veggies. I couldn't find any ground chicken at the store, so I used chicken thighs instead. Heat a wok over medium high and add a drizzle of oil. Saute the onion and chicken thighs until the thighs are almost cooked, about 15 min. Add a bit of water if it seems dry. Add in the rest of the ingredients and cook for another 5-10 minutes. Season with more soy sauce or salt as desired.